WVHS Engineering Club students building wind turbine to create electricity. 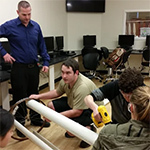 The dozen or so students who belong to the high school’s engineering club like solving problems and enjoy the hands-on learning the club provides. They work on projects that interest them, like renewable energy. 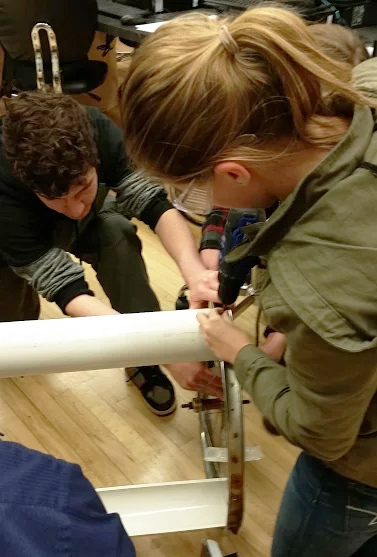 The students are currently building a wind turbine to create electricity, using parts from an old bicycle (donated by the police department) and PVC piping. 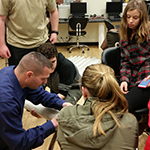 The Engineering Club meets once a week after school, and is led by high school technology teacher Mike Stolt (Robotics and Engineering,) and high school teacher and Instructional Technology Specialist Yvonne Koulikov.